On this day 2 years ago I pushed the “publish” button and posted the first page of Mare Internum… now it’s 2017 and I’m glad to honor our little anniversary with the start of some more subterranean dramatics~ Looking forward to sharing another strange chapter with you, maybe we’ll get a little closer to escaping the chamber this year! I liked this cover image this time around so I’ll throw it up as a wallpaper for Patrons in a bit. Haven’t finished that pesky tutorial yet so that will be up this week as well… But the public tutorial of the month is up now, so you can read that if you’d like to see my approach to researching for comics. Happy Anniversary, here’s to as many more as it may take! The Verne quote is fitting! Yes, it is indeed “8D”. Sorry for a weird nitpicking, i was trying to trace back the quote to Jules Verne and was unable to do so, but apparently, a roman playwright did? I think it was used by Verne himself as a quote of a popluar phrase. Dum vita est, spes est. I binged this in an entire night, it’s really cool. Just how many things will attempt to keep mike from healing??? to that Dee-lux apartment in the skiiii-eeeee!" Is that… magma? How is that possible on a planet with a solid core? The Earth’s core is solid too. The thing is that Earth is so massive that the pressure overwhelms the heat and keeps the core solid. The mantle around the core is liquid though. Mars could still have small amounts of magma, but not enough to be detected. It could also be just glowing water. It’s a sci-fi comic, it could be anything and everything. Mars has had volcanic activity as recently as one million years ago, which is peanuts in geologic time. Geothermal energy is one of the potential power sources a martian colony might utilise. Basically, while the core is solid, the mantle is still hot enough to melt rock. Turns out geology is not my field of expertise. Thank you for enlightening me! Yep, exactly… there are localized hotspots, and many of the larger volcanoes are theorized to possibly still be “alive” (ie not completely dead, but not exactly of eruption quality). In the comic, Devotion base is located near Ascraeus to source and possibly utilize geothermal energy. Also, not really relevant but I think it’s neat, because the core of Mars is no longer spinning, Mars doesn’t have a magnetic field like Earth does, but instead has small local fields based on rock composition. I did a bit more research. Mars probably still has a liquid outer core, but while the mantle is hit enough to have molten magma, it’s not hot enough for the outer core to have the convection currents needed to drive a magnetic field dynamo. I like the idea that Bex’s story might follow a different colour tone. Well this is just absolutely gorgeous. Hey shing, seeing your comment on this two year anniversary made me feel incredibly proud. And I mean logically I know this seems ridiculous, since I had no part in the creation of this or the meek, and I don’t even know you! But your comics and your internet presence have been such an amazing force in my life. I found the meek back when I was in highschool, I think, and at first it was just another webcomic. I fell in love with your attention to detail, all your hidden clues and background and the comments section on each page where readers made guesses and hypotheses based on your clues and you egged us on. But more than that, your background and continued interest in science and your excitement to keep learning, was a huge inspiration to me. From every other direction I was getting messages that my love for creativity and for science and math were mutually exclusive, and that someday I would have to choose and abandon the other entirely. And you showed me something different. by the time when you started this comic and brought the meek back from hiatus, my life had fallen apart and I had left school and I was horribly depressed. and obviously your comics didn’t solve that, because one thing never can, but seeing you come back and be able to keep creating and keep moving forward, to see the progress you’ve made, I think it helped. And even if it didn’t, it’s certainly made all of this a more enjoyable process. So now I’m back in school and I’m living a worthwhile life and pursuing things I care about, and it makes me incredibly proud to see this milestone you’ve reached. Congrats on two years of MI! It really is a beautiful, evocative comic. I cannot wait to own this in book form! Hey Shing, that cover and the Jules Verne Quote inspired me to rewatch “Journey to the Center of the Earth” (the 1959 movie, not the Brendan Fraser one). I really like it, exept for the weird, old timey mysogny. 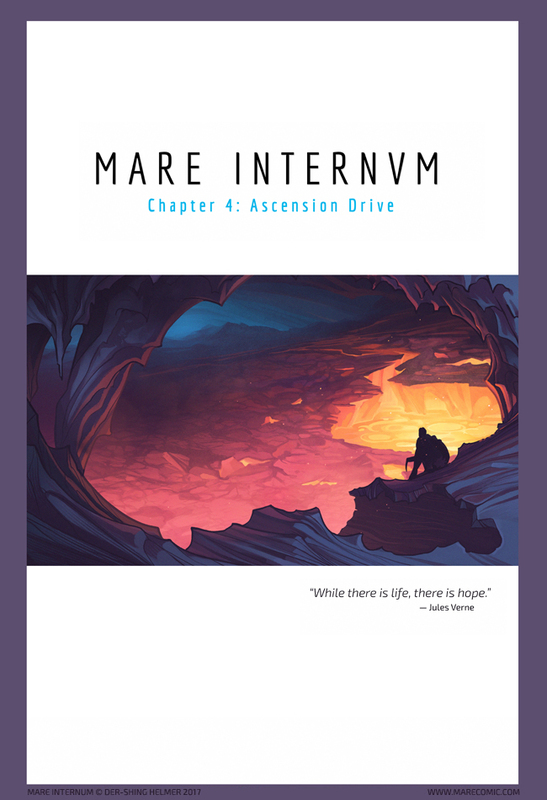 Was that story part of your inspiration for writing mare internum? Yeah, JttCotE (and 20,000 Leagues Under the Sea) were some of the first “adult” books I ever read, I think I was 8 or 9, and they had a big influence on me. I still prefer the adventure and exploration genre to any other, fiction or non-fiction :] I’d really recommend reading the book if you haven’t, it’s a very memorable adventure with some great visuals, and you’ll probably pick up on a few more easter eggs in this comic too. OK, I’m still confused about what LEVi is under…?